thinned out the lesser stars, which seemed to drown. This is the most delightful tercet in a rather forgettable canto that deals with the “slothful” -- those who, while alive, have not shown sufficient zeal for their tasks. These are not the “sullen,” or the deeply depressed souls who end up in a muddy bog in hell. These are the slackers, the unmotivated, those at the portal of depression because they see no meaning and no reward in their work; sometimes they literally don’t know what to do and how to do it. When meaning arises, as during a flood or another emergency, the supposed slackers gain a sense of purpose as quickly as others. 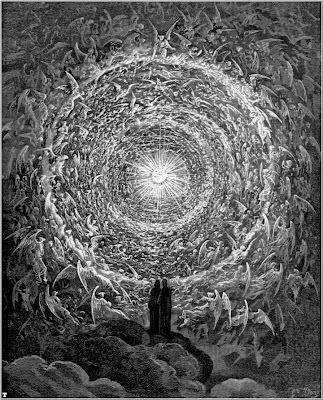 In Purgatory, the purpose arises in the form of wanting to get to heaven. The former “slothful” now keep running to show their zeal. “To be slow in love is to lose time” -- nice and aphoristic, but not what we seek in poetry. And even the arrow-minded Abbot of San Zeno who, without stopping, barks back his reply to Virgil and Dante, can’t quite break away from the preachiness that mars the Purgatorio and especially Paradiso. Perhaps we need to be slow in love -- slow and silent and without the go-go-go spirit. Lyricism starts already with “It was near midnight.” I am astonished that such a simple statement touches us in a special way. 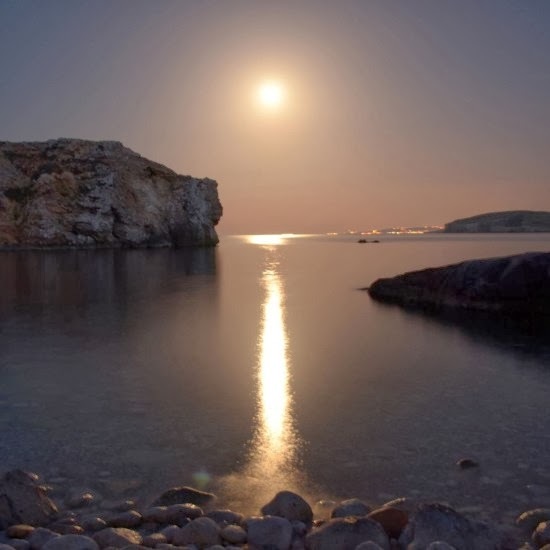 It’s “gazing at the world.” Suddenly we are connected with the hushed beauty of a moonlit night. We can forget ourselves in it as those “lesser stars, which seemed to drown.” There is no sadness to this drowning, only dissolving into light. And note the image of fire rather than water, which we’d expect to go with “bucket.” Yet the image water forces itself in, with the word “drown.” But the drowning is into light, a more unusual proposition. That’s of course how the stars “drown” -- they are invisible if one central light is too bright. As for the connotations of light, it would take many pages. It’s often associated with the divine. I don’t see why the soothing nature of darkness would be excluded as a manifestation of a benign deity, a soft-good night blanket -- but the cultural evolution of images has strongly privileged light. that leads men straight ahead on every road. Planet? I checked Ciardi’s translation: it’s planet. In Ptolemaic astronomy the sun was regarded as a planet. Yet elsewhere Dante speaks of the sun as a star, as confirmed by the famous last line of the Commedia: “the Love that moves the sun and the other stars.” It’s just the first smudge of dawn of the modern worldview here, but that smudge will eventually become a supernova destroying the scholastic certainties. Dante was already a heretic. His savior was Beatrice, and he knew that the sun is a star. 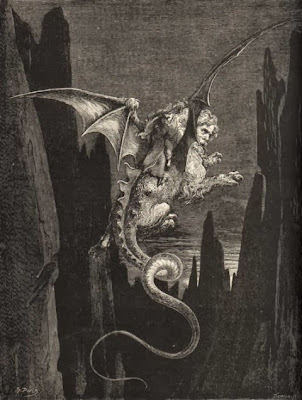 But back to Purgatory and Canto 18. Another taste of lyricism is not granted to us until the next canto, where we meet the Angel of Zeal, “with swanlike wings outspread.” But that’s straining at it. It’s not the same lyrical splendor, which needs to seem effortless like sleep. As Milosz says, “Even asleep we partake in the becoming of the world.” Cognitive processing is unconscious, and forcing a system on one’s imaginings deprives us of deeper thinking, which tends to be both unpredictable and metaphoric. Let the images come could be a poet’s sole prayer. But Geryon is my shameless digression in this post. Let’s consider more light. 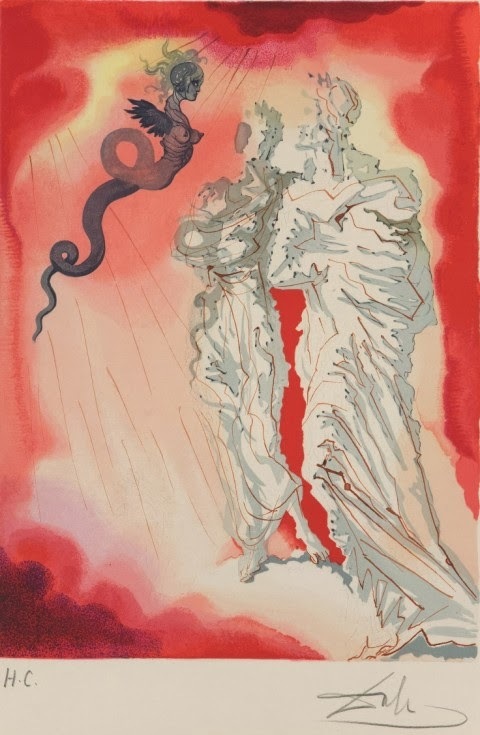 In Canto 28 of Paradiso, Dante reaches the Ninth Heaven, the Primum Mobile, “the first mover,” the outermost concentric sphere in Dante’s earth-centered model of the universe. This sphere imparts movement to all the inner spheres surrounding the motionless earth. circles creation in its endless gyre. Rhyme can be wonderful. But I also love the image of the earth “girded” by the multiple layers of motion. Dante the Pilgrim proceeds to the Empyrean, pure light (literally: “fire”) which is arranged like an immense white rose, often called Dante’s “mystic rose.” The souls of the saved are seated on the “petals,” immersed in bliss. We know that our perception of bliss depends on change, and we’d soon grow bored doing nothing but staring at a point of light. Yet obviously boredom could not exist in heaven, since that would detract from bliss. One solution that has been suggested is that the souls gazing at god have no memory, and thus are immersed in the eternal Now. in three clear colors bound in one same space. You love and glow, knowing and being known! to be depicted with man’s very image. My eyes were totally absorbed in It. Frustrated Reader of the Sublime, if you expected a clear description of the Trinity with fewer capital letters, you obviously had not been warned enough in childhood that the mystery of the Trinity is beyond human grasp. But on the page I have a helpful note affixed in a stranger’s hand: “Perfect self-sufficient ecstasy.” This is powerful, since Christianity has presented us with a suffering god. Dante imagines a happy god. Trinity is a Greek rather than a Hebrew concept. In fact in Judaism it amounts to the highest blasphemy. But let’s not worry about the jealous god of vengeance. Neither jealous nor vengeful nor suffering, god is three happy circles of light. Three happy circles of gaily colored light! How could those circles have memory, or anything to do with human suffering? But wait, the light emits love as it glows. There are those who claim to have experienced divine love. Is there a hint here of Einstein’s “friendly universe”? Not that Einstein ever claimed the universe was friendly; he only suggested that it’s an important question facing humanity. But perhaps all that matters if whether humanity is progressing toward being more friendly. Still, I admire Dante having come up with this geometry rather than presenting the painters’ cliché: a double throne in the clouds, two bearded men, one of them older, the dove hovering above, added for the sake of the number three. The dove was the best part. I miss the dove. But enough unreality. 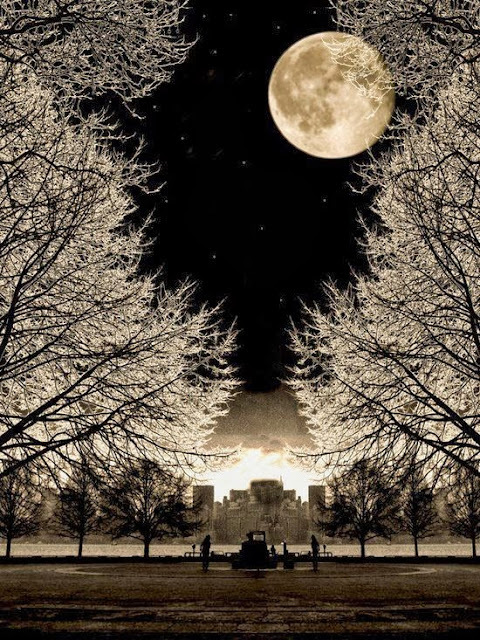 Since la luce etterna is beyond human grasp, let’s walk out into the night and look at the moon.